Please find all available patterns sorted into the categories below. All patterns are available as instant downloads: simply add your chosen design(s) to the cart and then Check Out Here or select ‘Buy It Now’ for instant single downloads. This classic hat combines perfect ribbing that disappears seamlessly through the decreases, a perfectly neat fold line and a brim that overlays in perfect alignment. The download for this classically shaped beret includes instructions for making this clever little hat in either DK weight or bulky yarn. 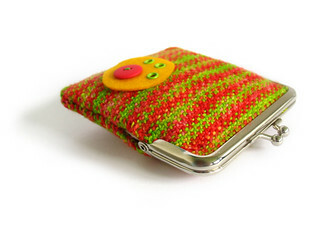 As two different weights are included it is perfect for stash-busting! 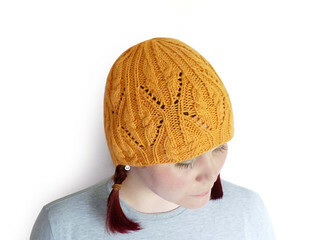 This decorative hat uses both simple cables and basic lace to achieve a pattern that flows from brim to crown. Pattern is both charted and written. 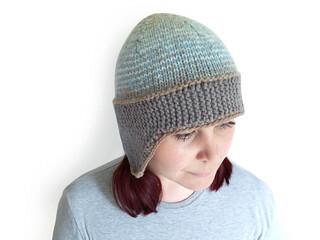 This hat has an interesting construction as it is knit both flat and in the round, in garter and stockinette stitch, both a solid colour and yet with stripes – all from a single skein. 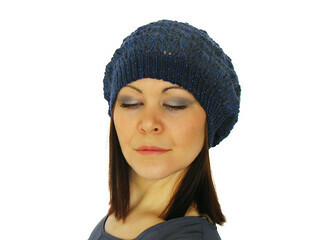 This relaxed fit hat is knit from DK weight yarn to work up quickly and easily. The simple lace creates gentle wave patterning and with the addition of a little sparkle in your yarn looks like a galaxy of stars. 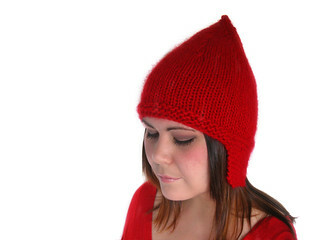 Cute and warm Gnomey Hat pattern. 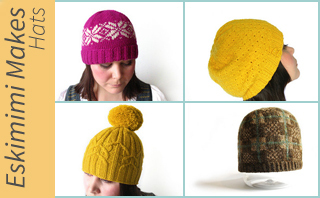 Shaping around the back of the neck keeps you especially warm and shaped ear flaps keep out cold gusts of wind. 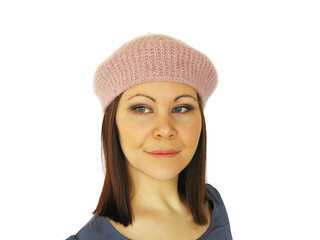 This stylish but subtle hat is perfect for both men and women. Slipped stitches provide gentle spirals of patterning, culminating in radiating intersecting lines in the decreases. 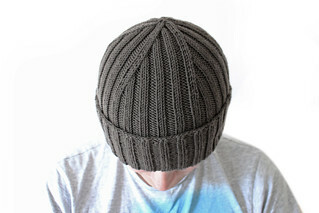 This beautiful, relaxed and chic hat has many small details that make it truly unique and a very interesting, though quite easy knit. Arcadia features an interesting rib pattern which flows seamlessly into a unique cable pattern which is reminiscent of Art Nouveau window detailing, or the marble arches of fantasy landscapes. 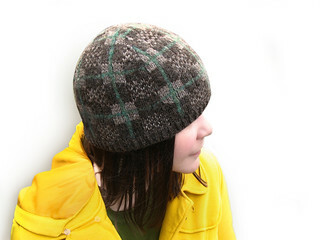 A Weekend in the Country is a modern shaped hat with a classic design and traditional patterning, reminiscent of traditional plaid woollen fabrics. The Snowbaby hat is a bright and modern hat equally suited to a day shopping as it is to a day on the ski slopes of a stylish resort. These warm and sumptuous socks are reminiscent of the elegant yet homely designs of fisherman’s pullovers. Argyle diamond cables are complimented by small vertical cables forming leg-hugging ribs for comfort and fit. This pattern includes both written and charted instructions for these beautifully ornate yet simple to knit socks. Minimal cabling and simple lace come together to make a show-stopping pair of socks. 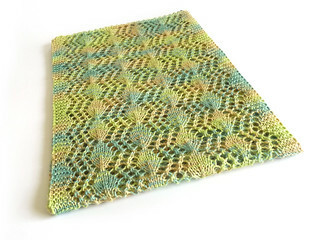 This classic design uses a subtle, but very effective stitch reminiscent of gentle waves in the sea.The lace pattern only uses 11 or 12 stitches and eight rounds, so you are sure to memorise it very quickly over just a few repeats. 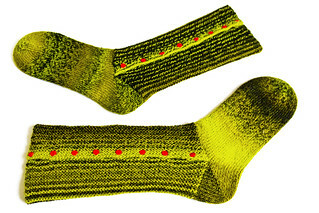 There are two sizes for this pattern, to ensure your socks are the perfect fit, and foot length is fully adjustable. A sideways knit leg with buttoned detail allows for a mix of super-comfortable vertical garter making way to a smooth stockinette foot. The mixture of super-cushioned garter stitch and option to button up or turn down the leg for a mixture of styles makes these socks incredible comfortable and versatile. These socks are a perfect knit for a pair of socks that are easy, yet interesting to knit, wearable every day, yet not boring. These socks finally give knitters a way of making the most out of variegated yarn and opens up a world of possibilities for some sock yarns you might not have known what to do with before to maximise their colour potential. The stitch pattern used in this sock plays around with the depth of knitted lines, so breaking up the variegated colours of the sock whilst also giving a slight texture to the socks. These socks were based around a new way which was devised to enhance and play with the qualities of self striping yarn.The effect of the stitch pattern is one which gives the finished item and almost ‘tweedy’ effect, with little flecks of colour spanning the colour changes. The pattern is in written form as the stitch pattern is so simple as not to need a chart. there is, however, a fully illustrated step-by-step guide on how to use the stitch to its best advantage included with the pattern. Garter stitch stripes and slipped stitches combine to make this simple-to-knit shawl that is completely customisable in size by simply knitting fewer or additional rows. Only one colour of yarn is used per row, and the mosaic knitting technique means that there are no awkward yarn floats! 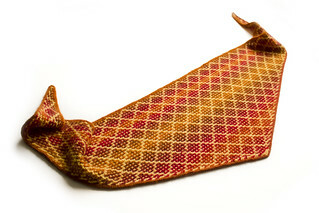 An iCord technique that wraps around the shawl edging is also included to finish. The pattern is given in both written and charted form. 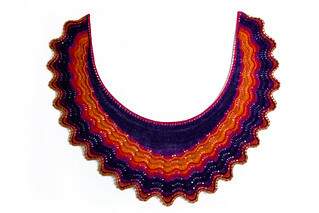 This beautiful small shawl uses only one 100g skein of 4ply yarn to create a magically beautiful crescent-shaped shawl that can be worn around the shoulders or as a scarf. A fantastically quick and fun knit. 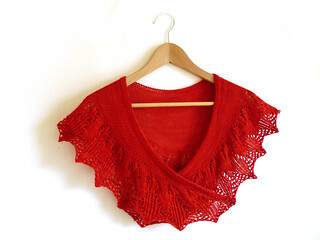 This beautiful small shawl uses only one 100g skein of 4ply yarn to create a magically beautiful horseshoe-shaped shawl that can be worn around the shoulders or as a scarf. Simple yet so elegant. 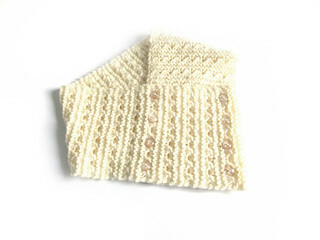 This fun little cowl is a quick knit that can be worn in many ways. the stitch pattern allows to you add ribbons, cords and even more sparkly things to your cowl, or leave it plain and let your yarn do the work of being beautiful. 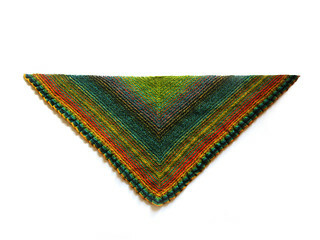 Triangular shawl featuring foxglove ruffled edging and striped body, made from a single skein of sock weight yarn. 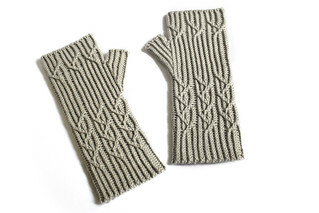 These decorative and functional mitts feature branch-like intertwined cables on an elegant twisted rib background. 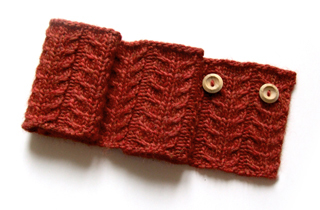 Pattern is both charted and written and features links to beautiful cast on and bind off tutorials. 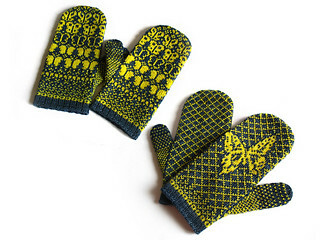 Stranded colour work mittens featuring a swarm of butterflies on the back of the hand and a large single butterfly on the palm. 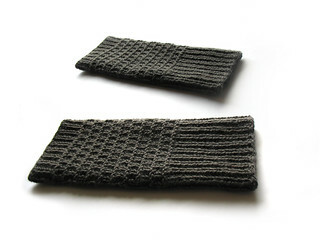 Attractive mitts knit in a thermal pattern. A quick project, knit in DK yarn and knit entirely flat using only knit and purl stitches. These Lateral knits feature an interesting sideways construction to make stylish vertical stripes and can be made to fit any size hand. 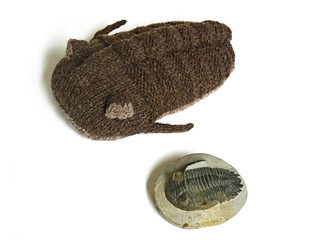 This pattern for your very own cute trilobite fossil includes detailed instructions as well as a diagram that teaches what each of the main body parts of the trilobite is called as you knit. Knit yourself a couple of ocean buddies with this pair of magnificent creatures from the deep. 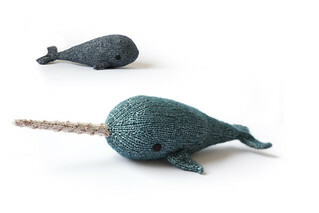 Both the narwhal and the whale are written with detailed, easy to follow instructions and require minimal sewing up, due to clever construction. The PDF contains the patterns for both the narwhal and the whale. A modern shaped stocking in cool and frosty shades with a simple repeated motif and feminine details such as a scalloped edge and pair of charming pompoms. 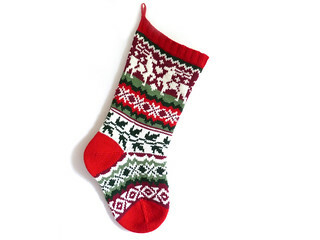 Modern shaped Christmas stocking in bright and vivid shades of Christmas. Knit stranded in the round, this stocking features easy-to-knit colourwork that never uses more than two colours in a single row. 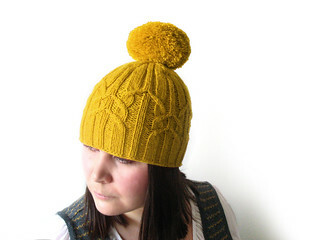 Bargain eBook containing four patterns: The Pamplemousse, Arcadia, Weekend in the Country and Snowbaby Hats, each available as single downloads in the Hats section. 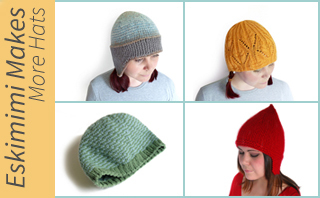 Superb second collection featuring four fresh designs: Twisted Flax, Gnomey, Betwixt and the very popular Marram Hat, each available as single downloads in the Hats section. This cute pincushion is a quick and simple knit using only a very small amount of DK yarn. 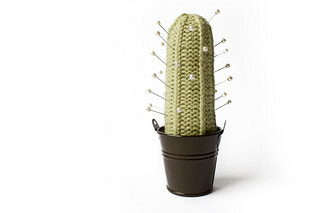 It provides the perfect place to keep your pins as the more pins you store on it the more cactus-like it becomes, which is fantastic for those crafters that have way too many pins. 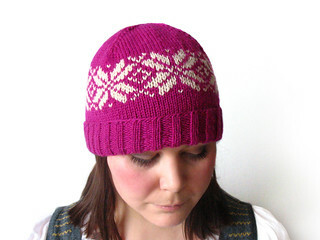 As it is such a quick pattern to knit is also makes a perfect gift for any crafting friends or family. 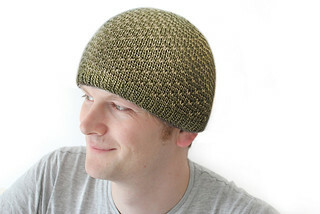 This hat is knitted from a single ball of extra-bulky yarn and can be knitted in a single evening in front of the TV, so makes a super-quick, very inexpensive gift choice. Due to the extremely simple nature of the pattern it is particularly suited to new knitters looking for a quick and rewarding project and a fantastic project to learn knitting in the round. This pattern is extremely simple. 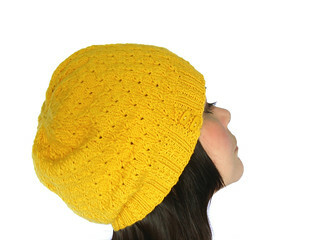 Minimal shaping and a simple repetitive stitch makes this a quick and easy knit. 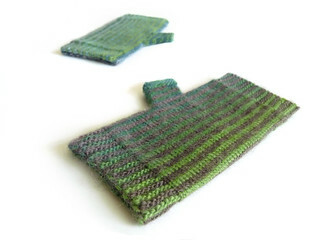 The purse is knit in two pieces as the seaming at the sides and bottom of the purse give the finished item better structure than if it were knit in the round. 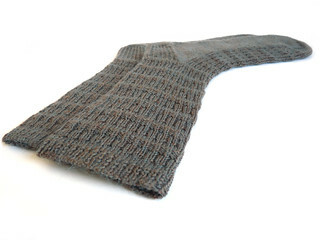 Soft buttoned scarf that takes only one skein of warm bulky yarn. A quick and satisfying knit, a yarn with natural fibre content is recommended for beautiful blocking. This DS case is both stylish and sophisticated and yet fun. 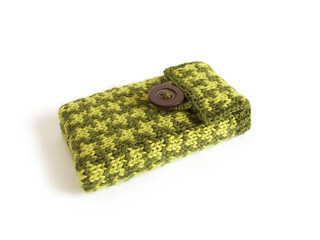 The houndstooth pattern gives a classic feel to this knitted accessory for a very modern item, and the colourwork pattern is particularly easy, floats never being carried across more than three stitches, meaning you do not need to worry about twisting the carried yarn in with the working yarn to secure it. This scarf lays completely flat with no curling, so whether you choose to block your finished piece or not is a matter of personal choice, not necessity. 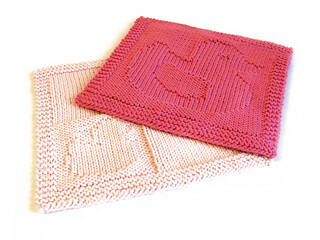 Two matching face cloths featuring simple textured knit and purl stitches that form small and large rubber duck designs. Worked in 100% cotton they are fantastic as baby shower gifts, gifts for young children and to give to friends with bathing goods. 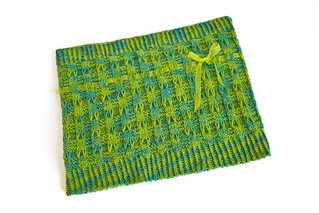 They’d also make fantastic dish cloths if you could bear to use them to clean with.